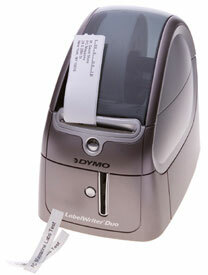 Dymo LabelWriter DUO - Direct thermal, label printer. 1 second per label, 55 labels per minute, USB. Includes printer, power supply, USB cable, Windows and Macintosh software and Users Guide on CD-ROM, printed Quick Start Guide, one roll of address labels, one DYMO D1 label cassette with black on white printing and one starter roll of DYMO Stamps. Compact and easy to use - LabelWriter DUO prints paper labels for all your office needs. If you want to print the widest range of label styles and materials, you need two labelmakers in one. Dymo LabelWriter DUO combines the features of 400 Turbo (for die-cut paper labels) with the versatility to print permanent nylon, plastic and polyester label cassettes. Compact and easy to use - LabelWriter DUO prints paper labels for envelopes, packages, files, media and more, plus permanent color cassette labels for filing, identification, presentations, and many more office needs.